The film is movie within a movie, showing a group of Indonesian former executioners and current members of the paramilitary group Pancasila Youth reenact the killing of communist, and socialist affiliated civilian population. The killings were carried out by direct support of western governments and US in particular and an estimated number of 500,000 to 2,500,000 people were killed between 1956-66 after the failed military coup that eventually lead to the fall of Sukarno and the commencement of Suharto’s thirty-year military dictatorship. The people responsible for these acts were never prosecuted, Pancasila runs strong with more than three million members and many of the killers enjoy political or economical positions in the military government and the governments that followed after the resignation of Suharto. 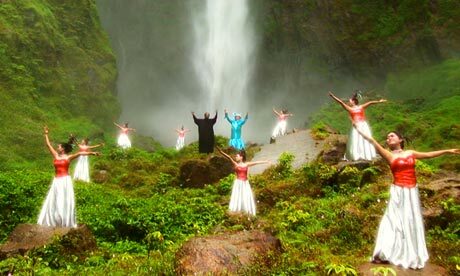 Co-directors Joshua Oppenheimer, Christine Cynn and an anonymous Indonesian director, interviewed a few dozen of executioners who boasted about the killings and most offered to take the directorial team to the locations where these acts were carried out. The movie follows the acts of one of the most prominent killers and a forefathers of Pancasila Youth, Anwar Congo who was also a member of the movie house gangsters, a group of thugs that gathered around movie theaters, scalping tickets as a side-gig – their main gigs being illegal gambling, running prostitution rings, smuggling, etc. Oppenheimer mentions that his initial intention was to tell the stories of the victims which was faced with restrictions, arrests and compensation of tapes by the military and secret police. Given the boastfulness of the perpetrates, he was suggested by one [or relative of] of the survivors to let the killers explain what happened. The movie theater gangsters, or preman in Indonesian, where recruited by the army to carry out the killings in the northern region of Sumatra. They were doubly motivated by the ban of American movies by the Sukarno government as it caused “dinner to miss the belly,” as explained by one of the thugs in the movie. 1- Act of killing, the deed, the taking of another human beings life, murder. The act of killing, acting and performing of the taking of another human being, acting as in theater and in film; the image of murder. 2- The American movie hero, the outlaw, the fugitive, the rebel. The image of freedom. Preman comes from the Dutch word for “free man.” The movie theater gangsters are/were free man, wanted to do whatever they wanted, similar to their film stars, “Al Pacino, Brando, Wayne” who portrayed the image of the free subject of neo-liberalism. 3- Image wars—the ban of American movies, motivated the movie theater thugs to join the killing squads. They walked across the street from the theater, intoxicated by the silver screen and carried out their deeds on the upper level of the newspaper office, they killed “happily.” The image of freedom against the image of equality, the image of capitalism against the image of socialism—In one of the interrogation scenes Anwar ironically tries to stuff a “neo-colonial” cigar between the lips of the victim. 4- The image of the perpetrator—In one of the scenes a fellow executioner, following the scene of interrogation and killing of a communist notes how this movie, if successful is bad for our “image,” meaning the image of those in power with direct links to the purge. While it is true that “we were the cruel ones,” if the movie is a success, it will contradict the claims of likes of Anwar that the communists were cruel. Image and counter image. 5- The spectator— the movie, does not deliver the victim testimony, the images of the victim reliving the horror of genocide, the new media footage, the image that re-victimizes the survivors. The survivors, who in fact solicited the documentation of the perpetrators, remove themselves from the field of representation and let the killers speak of their deeds. It is the labor of the spectator that imagines, and goes through the horror, not the survivor, not the victim, the viewer is required to participate in imagining what went on in the torture and execution chambers, the spectator is invited to suffer. 6- Executioner as artist? What about the notion that the movie posits the killer as a filmmaker, as an artist. To this, I will end with Thierry de Duve’s conclusion in Art in the Face of Radical Evil. To call Anwar an artist, “testifies to the impossibility of claiming to speak on behalf of all of us without speaking for the evil part of humankind as well s for the peaceful and civilized.” Anwar speaks for the evil, while it is up to the spectator to address the victims.